The Fowler/Hilliard Hut, owned and operated by 10th Mountain, was originally constructed in the summer of 1988. It was named for Ann Fowler and Ed Hilliard, avid mountaineers tragically killed in a climbing accident on North Maroon Peak near Aspen. Hut construction was generously funded by the Fowler and Hilliard families, and family friends. The hut site was first scouted in April 1984 and the hut proposal was formally approved in a June 1988 decision by the US Forest Service. 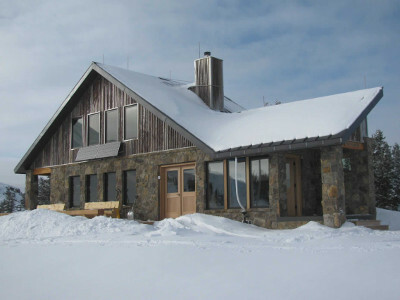 It was available to the public the following winter, and has proven to be one of the most popular huts in the 10th Mountain Division Hut System, averaging over 2,300 user nights (one person/one night) per year. The Fowler/Hilliard Hut site is located on US Forest Service land about 6 miles west of Vail Pass at an elevation of 11,500 feet. 10th Mountain rebuilt the Fowler/Hilliard Hut in the summer of 2010 because the original hut burned in September 2009. Layout and capacity: Upstairs: 1 room with a double bed, 1 room with 4 single beds, and 10 single beds in a communal sleeping area. Capacity 16. The Fowler-Hilliard Hut is handicap accessible during the summer season, please call for more details. The main winter route into the Fowler-Hilliard Hut follows a road up McCallister Gulch to just below Resolution Mountain. From the trail leaves the road and swings the backside of the peak before dropping down to the hut. This route is closed to all motorized travel during the winter. For a slight longer and more gradual ski in you can follow the marked trail that follows Resolution Creek Road before leaving the road to switchback up to the hut. 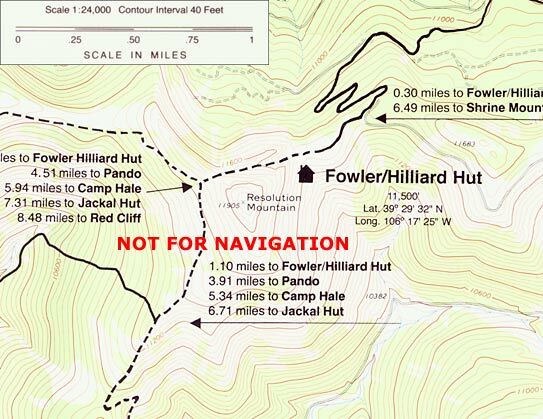 The main summer access to the Fowler Hilliard Hut is by hiking, biking or driving up Resolution Creek Road to the summer closure gate approximately 1/4 mile from the hut. There are no established hiking trails to the Fowler-Hilliard Hut and most of the other roads leading in are very rough and not recommended for vehicle access.Vehicle access is never guaranteed to any hut at any time. For day hiking you can head to the top of Resolution Mountain or over towards Ptarmagin Hill. The numerous roads and jeep trails in the area can make for some fine mountain bike loops.